Today we look at Defenders #127. The Assistant Editor for this issue was Ann Nocenti, "substituting" for regular Editor Carl Potts. Let's start by examining the cover at the top of this page. We get the "Beware" stamp plus the "Warning" in the left corner. 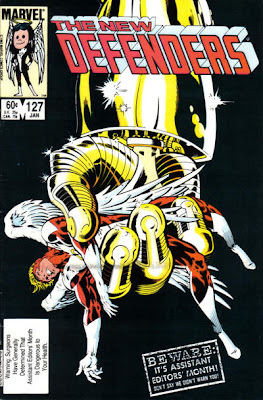 Instead of the usual Defenders in the corner box, we get a caricature of Nocenti, wearing Angel's costume. The main Defenders story contained in this issue is a "normal" tale with no jokes or AEM silliness. 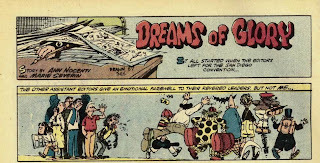 But it opens with a short story titled "Dreams Of Glory", written by Nocenti herself with art from Marie Severin. 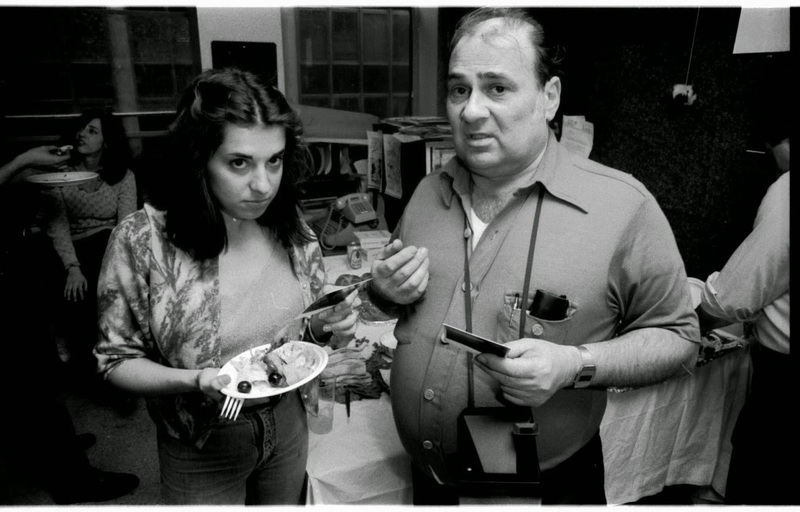 While Marvel's Assistant Editors bid farewell to their bosses (who are leaving to attend the Comic Con), Ann Nocenti runs off to her office. She changes from "dainty, demure, devoted assistant" into Super Editor! 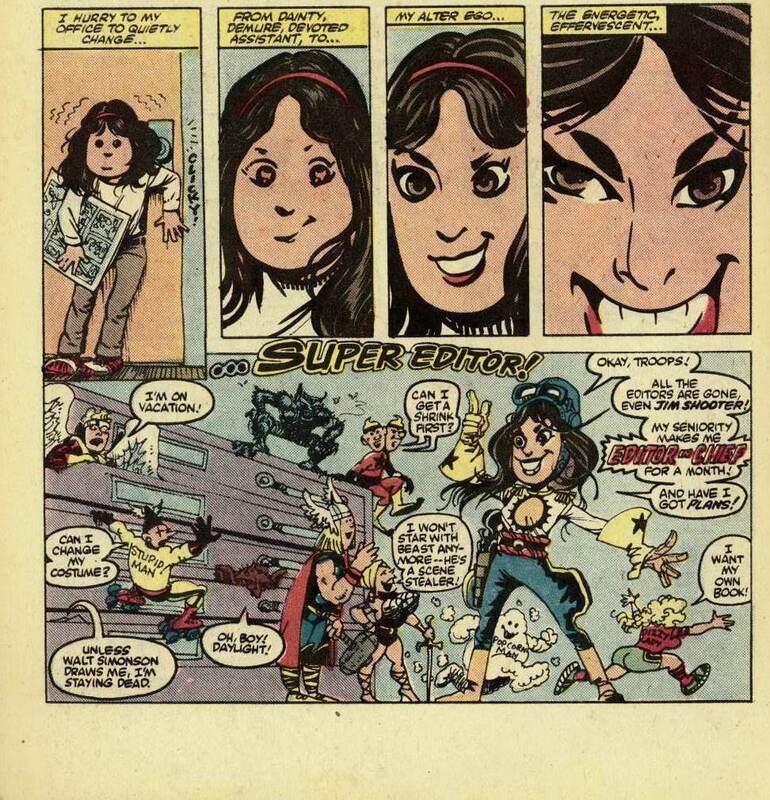 Nocenti declares herself Editor In Chief in Jim Shooter's absence. Superheroes start climbing out of her file cabinet making demands of Nocenti. Unfortunately, Nocenti's new editorial powers go to her head! She gets Stephen King to write a series! Nocenti decides to kill off characters (including Daredevil!) as a way to clear out the "deadwood." She threatens to kick freelance creators to the curb if they miss deadlines! Marvel is thriving under her leadership, when suddenly, production manager Danny Crespi knock's on Nocenti's door. 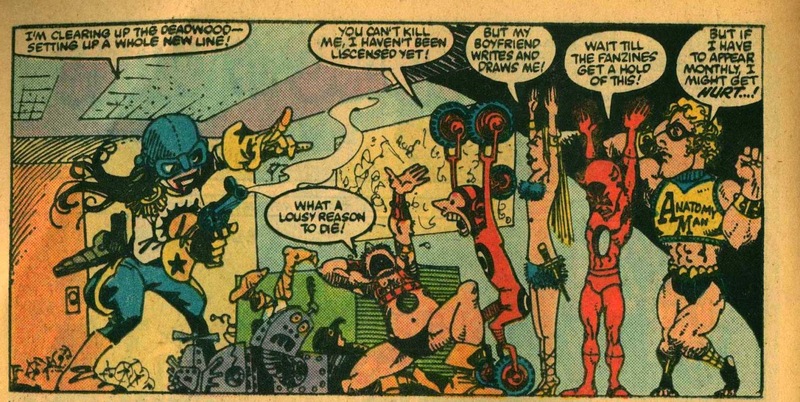 The knock snaps Nocenti out of her delusion, turning her back into her "lil' ole me." And that's how the story ends. 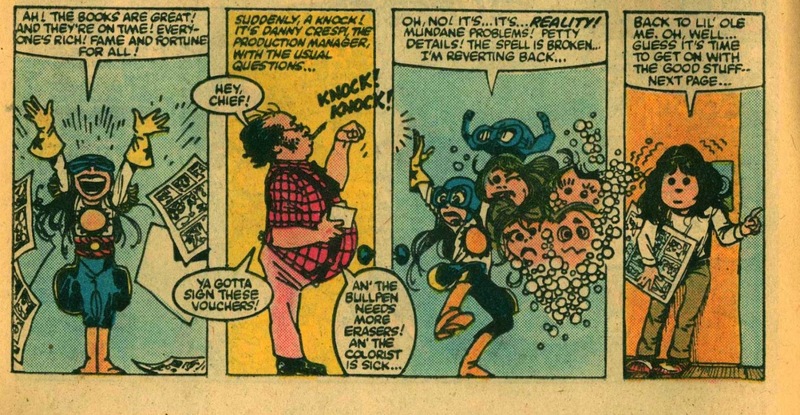 Nocenti's great career was covered in an earlier post, read more about her here. Production manager Danny Crespi worked for more than 30 years in the industry, starting as a letterer. Marvel employed Crespi as head letterer and later production manager from 1972 until his untimely death in 1985. 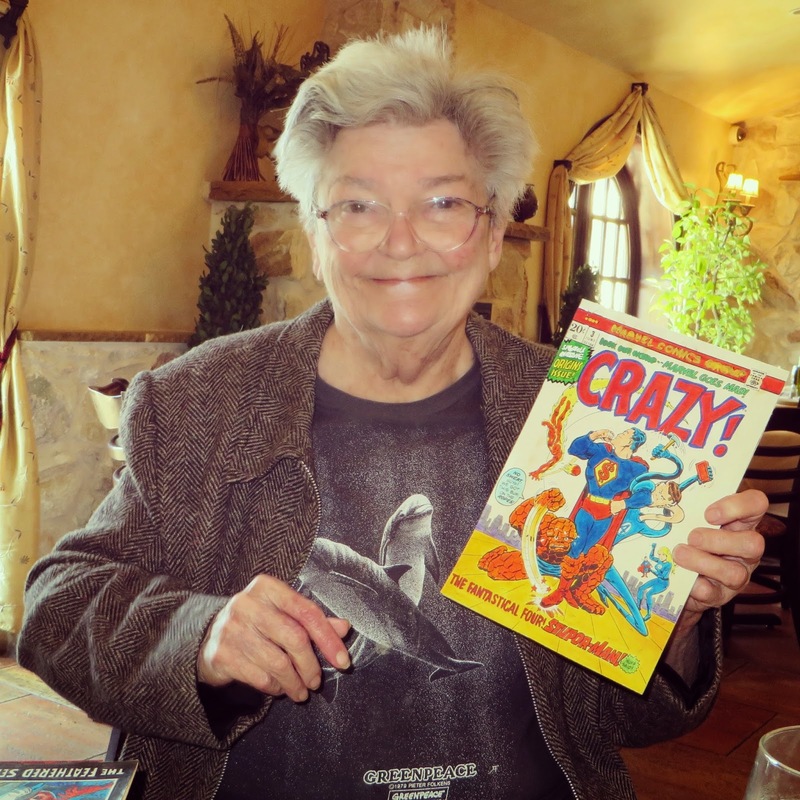 Penciler Marie Severin is a comic book legend. 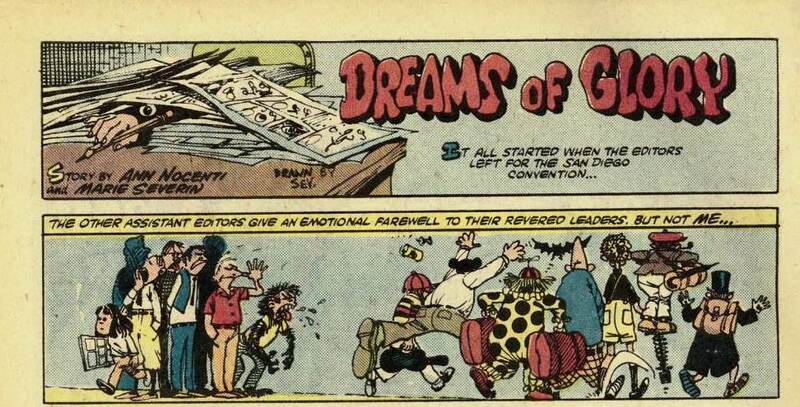 She worked as an artist and colorist in comics from 1949 into the 2000s. I discovered her work via back issues of Tales To Astonish and Crazy magazine. Severin turned 85 last August and her work was recently the subject of an art show at the University of Southern California. Author (and former Marvel Assistant Editor) Scott Edelman occasionally visits his friend Marie and shares stories and photos of their visits. Based on Edelman's reports, Severin is doing well and still enjoys sketching superheroes. 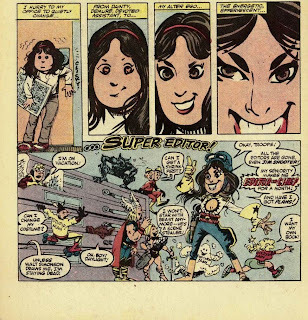 Thanks to Annie Nocenti and Marie Severin for producing a short-but-fun AEM story!